The Genesis Flood was a unique event, and evidence of its occurrence can be observed today. My wife and I enjoy seeing evidence of the catastrophe, which brings us to a recent ride in West Virginia along highway 55/48. Our November day in the West Virginia mountains began with walks with grandchildren to the local river in Tygart Valley. 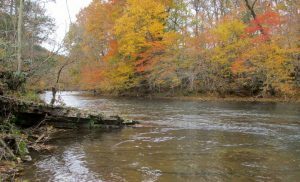 We had already found marine fossils (deposited from the Genesis Flood era) in a dozen places on previous walks, but I wanted to see the Fall foliage colors and the pristine waters of a little river as it flowed over rock ledges. Those ledges are uplifts of sedimentary rock, like the little ledge on the left of the picture. In other places, the ledges still have enough sharpness and height that they form a water ledge like one in the second picture. A few hours later my wife and I were traveling eastward along a stretch of modern highway that makes its way across successive ridges of mountains in northern West Virginia (a couple hours driving time west of Washington DC). 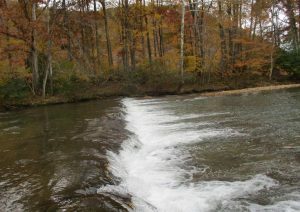 We passed through water gaps, which were formed during receding flood waters during the Genesis Flood. Water levels at that point were near the tops of the newly formed mountains. The layers of sedimentary rock were still soft enough so they gave way in a few places to the huge forces of water as they headed eastward to what is now the Atlantic Ocean. As waters lowered further, they would be channelized by the ridges and scour valleys, most of which are typically oriented northeast/southwest. — Layers would show differences in the deposited materials–some dark, some light, and many varying in hardness. Softer layers were often eroded in just a few years since the highway was cut because they are soft. Yet, they would often be under layers that had more rapidly turned hard when the Genesis Flood occurred. Those layers show much less modern erosion since the highway excavation laid them open. The variations were endless, which is what one would expect in a catastrophic flood, where turbid flows of water (water laden with debris, silicates, and limestone, for instance) would quickly lay down meters of layered material, and content would change dependent on the time and origin of the individual Tsunami-like waves that crossed the local area. — From ridge to ridge the thickness of sedimentary layers vary. Thicknesses of layers changed from a few centimeters to many meters in some places. Some layers started thick then narrowed and would disappear in less than a few hundred meters. Other times layers stayed thick and large through hundreds of meters. We would expect to see these things because the catastrophic flood would have had turbid flows during rapidly changing conditions. — More earth movements occurred later in the receding part of the flood (Psalm 104:6-9), giant “wrinkles” in the uplifted earth (known as the Appalachians in the Eastern US) would bend those layers of deposited layers of sedimentary material. There are numerous places along the highway where we could see the bends in multiple rock layers. Sometimes the bends are sharp but others are very gradual. — The angle and thickness of the layers changed by location along the ridges and from ridge to ridge. The variations are expected since they speak of both flood conditions and later crustal movements as the new continents were rising and the valleys deepening. The receding period of the Flood was as catastrophic as the early stages. The popular view of extremely long “deep time” (millions of years) change on earth’s surface features may appear rock solid (no pun intended). However, the evidence of the Genesis Flood in sedimentary rock, like what we observed during our day’s drive across the ridges of West Virginia, strongly “speaks” of widespread rapid catastrophe. Similar observations can be made in many other places. All of this brings into focus the Bible’s record about what happened during the Flood, where the size (worldwide), depth (above the mountain tops during the event), and duration (almost a year) of the event is recorded (Genesis 6-9). In a larger context, what happened in the Flood goes back to why things went so wrong. The Bible describes God’s assessment of mankind just prior to the Flood and why He initiated the event. The deterioration in man stemmed from man’s disobedience or faithlessness as recorded in chapter 3, which occurred shortly after Creation (chapter 1 and 2). Things got much worse during those generations that followed. God’s assessment of a “very good” creation was in stark contrast to his assessment of mankind by the time of Noah. The decline of man during the period takes up Genesis 3-9. The view may be unpopular or outright refused, but that does not lessen the truthfulness of those first chapters of Genesis. It’s no wonder the events are referenced in the New Testament (like 2 Peter 3 and Matthew 24). The only solution to our wayward ways is to return to God, and that return is through the Savior, Jesus Christ. For more information on those first events, read the initial chapters of Genesis. Download the free Bible study under <courses> on this site. A recommended site for many articles on the topic is www.creation.com. Tagged Bible, creation, Genesis Flood, sedimentary rock.